LUMPENPROLETARIAT—Walter Scott, who was slain by police in broad daylight earlier this month, has made the national news headlines again. Today, the nation’s attention has been called to Walter Scott’s family, as they gathered in North Charleston, South Carolina, on Saturday (11 APR 2015) for his funeral. Meanwhile, the informed nation reflects upon the increasingly visible persistence of extrajudicial killings of unarmed citizens by cops, who seem to be above the law, when, in fact, as officers of the peace, must be held to even stricter standards of care than the duty of care already expected of civilians. As influential American linguist, philosopher, cognitive scientist, logician, political commentator, social justice activist, anarcho-syndicalist advocate, and political commentator Noam Chomsky has long argued, our nation, like most advanced nations, is drifting towards fascism. Perhaps, he would update his previous position to say we have arrived, in the USA, at a state of fascism already, as police kill with impunity. We will follow this story, over time, and compile news and information related to this extrajudicial killing by cops. Read more at DEMOCRACRY NOW!. 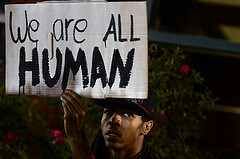 DEMOCRACRY NOW!—(13 APR 2015) Hundreds of people gathered in North Charleston, South Carolina, on Saturday for the funeral of Walter Scott, the black man fatally shot in the back by police officer Michael Slager.